Q: What do tennis balls, rice-sacks, spray-paint, cardboard boxes, marker pens and glitter have in common? A: They were all used in a creative and sporty UP workshop in a Nairobi slum, to help children improve their literacy and learn about health and hygiene. Improving children’s health, hygiene and educational performance in situations of extreme deprivation are huge challenges in international development today. They require fresh thinking, and United Purpose has stepped up to the challenge through an innovative partnership with Sadili Oval, a sports academy and social enterprise located on the fringes of Kibera – one of Kenya’s most deprived and dangerous slums. The joint project, ‘Court of Dreams’, uses tennis (the main focus on Sadili Oval’s sports programme) as a vehicle for education and awareness-raising to bring about behaviour change. Through weekly tennis and play sessions on Sadili Oval’s tennis court (one of the few sports facilities in Kibera), children have enjoyable, and therefore memorable, learning experiences. This means they will come back for more and continue to learn, and also take messages home to their siblings and parents, spreading messages about washing hands after using the latrine and the importance of buying soap, etc. The tennis sessions also integrate literacy and numeracy skills into the WASH (water, sanitation and hygiene) learning, enabling the children to perform better at school. UP supported Sadili Oval staff to develop WASH-themed sport and play activities that also included reading and number skills. 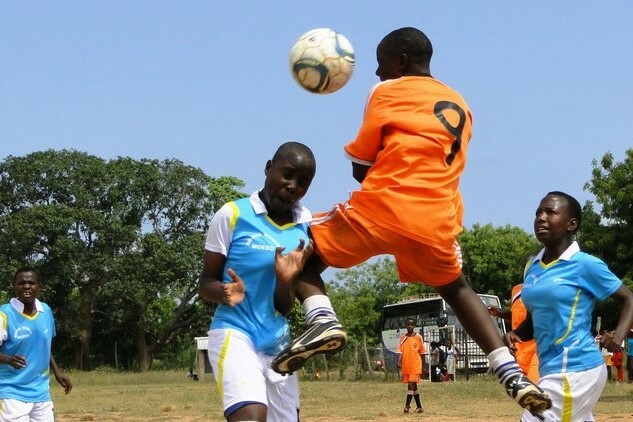 Creating such games takes a fair amount of imagination, and is particularly challenging in Kenya where sport- and play-based learning is a novel concept. UP provided the Sadili staff with ideas that it had already developed and tested in its Guinea and Malawi programmes, but it still took time and encouragement for the staff to overcome their reservations (shyness, lack of confidence, doubt) and think creatively. In the workshop, staff were also encouraged to use unconventional materials in play sessions, and to make materials themselves. Glitter, for example, can be used in games about hand-washing (in which the glitter represents ‘germs’ passed by hand from child to child) – and staff also made giant, colourful dice, which can be used for number games and in WASH quizzes. After the workshop, the staff, with some bravado, tested out the games with a group of children. They formed words and sentences about WASH through games with tennis balls marked with letters – and they practised times tables through throwing and catching games. Some games worked amazingly well (proven by the volume of the kids’ screams and laughter! ), making it highly likely that they would come back for more fun and learning the following week. Other games didn’t quite work (the rules weren’t clear and the children got confused) but this was all part of the staff’s learning experience on how to develop and deliver sport-based learning sessions. At the end of the day, the staff went home from the tennis court satisfied that the kids had enjoyed themselves and learnt something, as they had themselves. The advantage tennis is bringing to kids in Kibera – both off and on the court – is clear. Kibera is notorious for being one of the most deprived, dangerous slums in Kenya. Children growing up there face many challenges, but two in particular stand out - access to WASH facilities, and education. In the densely populated slum, there are few latrines, and clean water is scarce and expensive, meaning that water-borne diseases such as diarrhoea and typhoid are rife. The government is unable to provide adequate school places for the tens of thousands of children in the slum, so education is often only available in informal, ill-equipped schools, sometimes little more than shacks made of corrugated iron. Older Post"We were only able to bring our children, and nothing else"